Learn more about this program that helps Ithaca College and Cornell University students "provide friendly visiting services to older adults in the Ithaca community to build intergenerational relationships and recognize elders’ value as community members." A student organization at IC, Project Generations was founded in 2010 and is run by junior Mary Claire Hartford ’15. The organization pairs its members with elderly partners in the community, and they meet once a week. 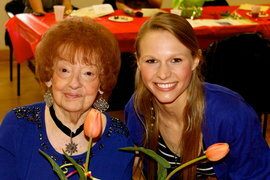 An Ithaca Leadership Scholarship recipient and cross country runner, Hartford was interested in joining Project Generations because she realized that seniors in the community (such as her paired senior, “Grandma” Ruth) have a wealth of knowledge. Project Generations made Hartford realize how differently her generation lives from her grandparents’ generation. “My experiences with Ruth have reinforced that no matter a person’s generation, background, experiences, and beliefs, we are more similar than we think we are,” Hartford said. Hartford loved learning about Ruth’s years growing up in Ithaca and how much the city has changed. “When I first began visiting Ruth as a freshman, I knew almost nothing about the city of Ithaca and its history. Ruth, on the other hand, had lived in the Elmira-Ithaca area all of her life and had seen drastic changes occur outside her window for over 94 years,” Hartford said. Ruth would reflect on how many more buildings, people, and businesses had come to the city, changed it, and sparked “new energy” with each decade. Every Sunday, while making hot cocoa and eating cookies or playing card games, Ruth shared countless stories with Hartford about her upbringing and the evolution of Ithaca, or gave Hartford general life advice. Although Ruth has passed away, Hartford continues to have hot cocoa and cookies on Sundays in her honor and says Ruth will always be a part of her family. Ruth gave Hartford a bracelet with the word “hope” on it, and she wears it every day. Hartford values the time she and Ruth shared, and she sees Project Generations as a way for students at Ithaca College to form close bonds with members of the community. Hartford’s relationship with her own grandmother has strengthened, and they are more connected than ever. “I thank Project Generations for helping me to reach out not only to elders in the community but also to elders in my own family whom I love very much,” she said. Because of her experiences with student organizations such as Project Generations, Hartford, who is a student in IC’s physical therapy doctoral program, says she’d like to work with older patients, and she believes her current experiences with older people will enhance her professional career. “I am excited and confident about my future in the physical therapy world,” Hartford said. Read more about how IC is connecting students to seniors.